Squatter village defies the label of “temporary”. Across the street from the dirt entrance to Vasant Kunj men and boys worked the many hoses of the blue water tanker, and filled plastic jugs to the brim. NEW DELHI — Across the street from the dirt entrance to Vasant Kunj men and boys worked the many hoses of the blue water tanker, and filled their plastic jugs to the brim. 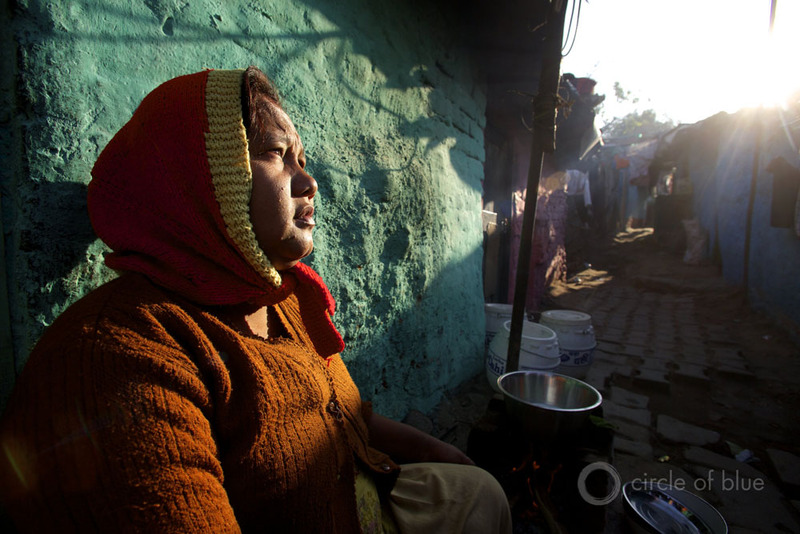 Inside the community of brick-walled huts the smell of spices and breakfast hung in the air. Men and women stood at doorfronts brushing their teeth. Children were everywhere. Vasant Kunj is one of the hundreds of squatter communities that Delhi authorities define as “temporary.” But the stout walls of the huts, the hard-packed dirt alleys, the numerous tiny stores, the public toilet, even the steady gaze of the adults greeting visitors seemed to defy any notion that anything about this community was temporary. A Michigan suburban neighborhood sporting real estate sign after real estate sign. That’s a temporary community. There wasn’t a single empty hut among the nearly 1,000 huts that stand in Vasant Kunj, which was built starting in the late 1990s. Residents said 5,000 to 6,000 people lived here. Inside the community of brick-walled huts the smell of spices and breakfast hung in the air. In fact, Vasant Kunj, like so many other slum hut neighborhoods, exhibits many of the same features — busy streets, well-stocked tiny stores, a makeshift school, barber shops and car repair bays — of Delhi’s middle class and wealthy neighborhoods. Except slum hut neighborhoods don’t have running water. That’s why twice a day, once in the morning before noon, and again after three in the afternoon, women dispatch their sons and husbands and men friends to fetch water from the water truck. Today, Amit Arora and Shashi Malik, staff members of Water For People’s Delhi office, guided us through Vasant Kunj, in south Delhi, and through a second slum, the Geeta Colony in east Delhi. About half of Delhi’s 20 million residents live at or below India’s urban poverty line – making their way on less than $1.00 a day. 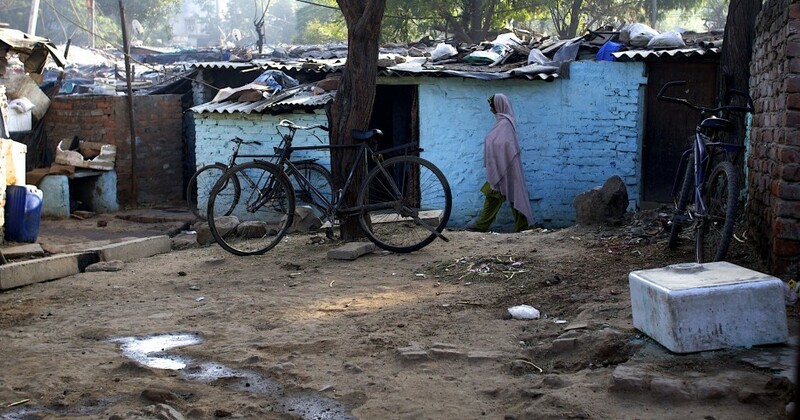 The residents of Vasant and Geeta are doing a little better, some earning $3 or $4 a day. That’s enough for residents to build tiny brick huts painted cerulean blue, and for transient workers to rent a spare room or a shed for 60 cents a day. Delhi’s slum hut neighborhoods spring up on expanses of rubble, or in empty lots, or in abandoned industrial areas, or along some of the city’s busiest streets. The alleys in both slums teemed with people — women caring for infants, children scrambling around doorways, men eyeing us with interest and suspicion. Inside the tiny homes, most with the floor space of an ordinary American bedroom, though divided into two or three areas, meals are cooked. Deals are made. Both communities have electricity, so televisions were around and so was an iPod connected to amplifiers and speakers. Both communities also had public toilets. Neither the homes nor the land on which they stand come with any sort of property right. Delhi’s slum hut neighborhoods spring up on expanses of rubble, or in empty lots, or in abandoned industrial areas, or along some of the city’s busiest streets. They can be cleared by authorities without notice, and occasionally some are. But the stable slum neighborhoods like Vasant Kunj and the Geeta Colony exist as a result of their political influence — adults vote — and their financial patronage. The local ward boss ensures slum neighborhoods endure because he or she can expect support at the polls. Typically he or she can also expect to earn a bit extra from the various under-the-table payments received for favors, to solve problems, to smooth the way, like when things get rough with the police. As Katherine Boo reports in her stirring 2012 narrative of a Mumbai slum, “Behind the Beautiful Forevers”, such payments are an essential component of the economy of the poor, and those that serve the poor. The alleys in Vasant Kunj teem with people — women caring for infants, children scrambling around doorways, girls and boys finishing chores. In our time in India, my Circle of Blue colleagues and I also have learned that much bigger payments are an essential component of the economy of the rich. The latest list of the Forbes 400 richest people in the world includes 48 Indian billionaires. Except for a handful of executives and entrepreneurs who made their riches in software and the digital world here, the others were involved in energy, real estate, construction, and other industries controlled by the government. Permits, leases, regulations, and policy changes are valuable items here. A major scandal involving corruption in India’s coal sector is unfolding as I write this. My sense after 10 days of reporting here is that inadequate funding is not the sole reason that New Delhi, and all of India, is having trouble supplying water and sanitation to a huge number of its residents. Some 400 million people in India don’t have running water. Some 700 million don’t have flush toilets. In Vasant Kunj, there is no running water. Water comes in tankers twice a day. The slum neighborhood clearly has done enough to secure its place on the land and in the system to make sure the water truck arrives every day as scheduled. Choke Point: India is an ongoing Circle of Blue series, produced in partnership with the Woodrow Wilson Center’s Asia Program and China Environment Forum. Through frontline reporting, the project finds new and powerful evidence of a ruinous confrontation between water, food, energy, and climate that is visible across India and is virtually certain to grow more dire over the next decade. Choke Point: India is part of Global Choke Point, which is uncovering new data and strategic narratives about water, food, and energy in the world’s most vulnerable regions.